This is the fourth and final entry in a series of conversations with scholars in the F. A. Hayek Program for Advanced Study in Philosophy, Politics, and Economics at the Mercatus Center at George Mason University. In this installment, I am joined by Peter Boettke, University Professor of Economics and Philosophy at George Mason University and Director of the Hayek Program. In this conversation, Pete and I discuss the commonalities between the three approaches to understanding the social world discussed previously in this series: Austrian economics, public choice economics, and the Bloomington School’s multiple-methods, real-world approach to institutional analysis. Individual actions are the primary unit of analysis in social science. (Often short-handed as methodological individualism.) Even though this puts the focus on the choices and actions of individuals, all three approaches still view the connections between people as critically important. This is very different from atomism, which views people as fundamentally disconnected from each other and their environments. Further, methodological individualism does not require a narrow definition of self-interest. No particular assumptions about how much or how little an individual cares or is willing to sacrifice for the happiness or betterment of others are required. In fact, practitioners in these three schools of thought usually try not to make grand claims about what it is that people value because of a shared recognition that…. Context matters. Although analysis begins with individual actions, the context within which the relevant people are operating matters. Every environment has different rules (both formal and informal), and therefore the same action will have different results depending on where you are, who else is involved, and the other particulars of the situation. This is important to social science because understanding what rules are at play in a particular time and place is an important part of understanding why the people involved chose a particular course of action. This is emphasized by all three approaches discussed here, and is why the Bloomington School places so much emphasis on putting yourself in the actor’s environment, so you can see what sorts of pressures and rules they face. In addition to holding these assumptions about how society should be studied in common, there is also a shared view that the most important questions in social science are those aimed at better understanding the processes underlying social systems. Many of the important insights of the early Austrian economists, including regarding the limitations of socialist economies, were derived by focusing on the process through which prices emerge. Those working in the Virginia public choice tradition focus on the processes within political and other non-market systems in order to understand how the incentives and constraints within those systems affect behavior and thereby outcomes. Practitioners within the Bloomington School focus their attention on the processes through which groups create laws and other governance systems. This emphasis on process is so important — perhaps, inevitable — because we live in a world that is constantly in flux. Frustrating as it may be, the world just won’t stand still. Social, political, and economic systems are made up of people who are continuously acting and reacting. As people act, they affect each other and their environments; with these changes, the patterns of action and reaction change. Knowledge of particular changes in those patterns can be useful, but any sort of enduring understanding about how social systems actually operate can only be achieved by better understanding the how and why of change itself. (To paraphrase a perhaps cliché bit of Greek philosophy, the only constant is change.) This means focusing on processes rather than on isolated moments in time. I’ll end by directing you to just a few examples of research that explore questions about social processes using methods that recognize the importance of individual actions, subjective valuation, and context. Peter Boettke’s Why Perestroika Failed: The Politics and Economics of Socialist Transformation, which combines public choice and Austrian economics to reveal the processes at work within the bureaucracy of the Soviet Union. Emily Chamlee-Wright’s The Cultural and Political Economy of Recovery: Social Learning in a Post-Disaster Environment and Community Revival in the Wake of Disaster: Lessons in Local Entrepreneurship by Virgil Storr, Stefanie Haeffele-Balch, and Laura Grube, both of which use the fieldwork methods eloquently advocated for by the Bloomington School in order to understand how post-disaster recovery is affected by the knowledge systems and incentives at play in the local environment. Christopher Coyne’s Doing Bad by Doing Good: Why Humanitarian Action Fails, which uses Austrian economics, public choice economics, and institutional analysis to understand the process through which the wealthy try to aid the less fortunate, and why that doesn’t always turn out so well even when intentions are good. Those are just a very few of my personal favorite examples. I know there are many more, and there are probably even more that I don’t know. Please do comment to share any particular favorite examples of your own. If you’re interested in learning more about how and why these three approaches work so well together, you can listen to my full conversation with Pete below and sign up to be notified when future conversations are posted here. 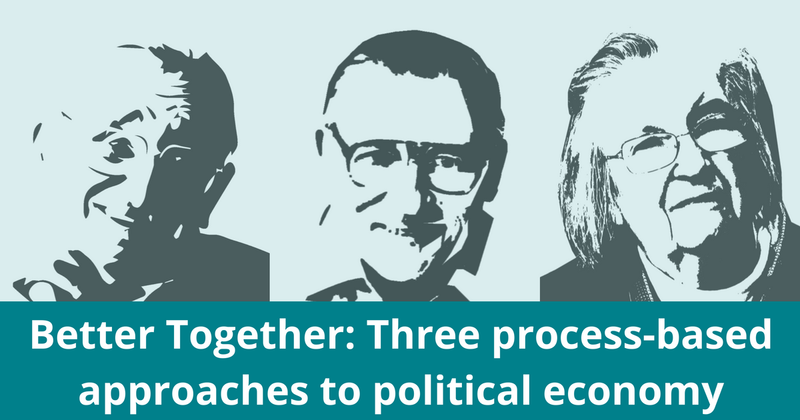 If you’d like to take a step further, you can read here about the fellowships and other opportunities available to the core ideas in political economy through the Mercatus Center.